I rent a Jeep with a girl from eslovaquia, who currently works at Brussels european commision, her boyfriend from czesch rep. and some hungarian guy. This jeep was a Lada Niva, so it was quite strech inside. 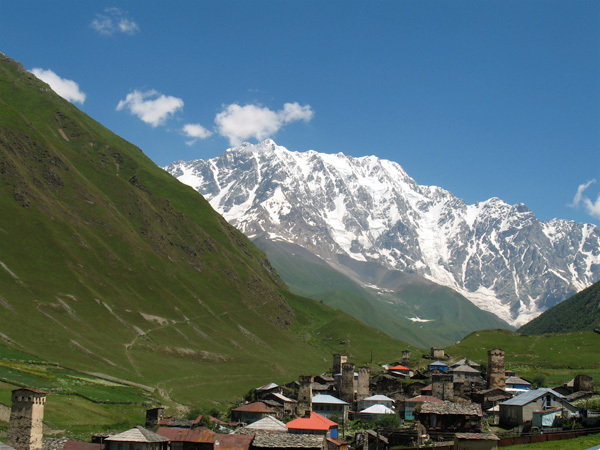 And because of the road quality, you needed 3h for 65 km, up in one of the most remote parts of the caucasus. This towers in the town are amazing, and we went till the very base of the glacier, with a couple of imponent white mountains upon us. It was a tiring day but delightful. It seemed that there would be no free plane on Monday, but insted some cheap 25 Laris on Tuesday. It is too late so I decide to departure tomorrow at 5am. Ihad to say goodbye to my 2 nights, no english speakers but great understandings family. Irina, the mother and teacher of the town, invited me to some Matsoni(yogurt) and the father, who is also teacher and ingeneer, was amussed trying to find a Spanish channel on the satellite. Again the question of that the Basque Region people are Iberians rised up. I still don't know where I missed my history lessons, wheren the iberians not suposed to live near the mediterranean see? well it was really beautiful to see all those towers iluminated at the evening against the dark shape of tall mountains.